POP! MAX continues to broadcast older generations of the Pokemon TV Anime as following on from Pokemon Black & White as well as Pokemon Black & White: Rival Destines, which broadcast on sister TV channel POP!, the network are now broadcasting the final installment into the Black & White timeline; Pokemon Black & White: Adventures In Unova as well as Pokemon Black & White: Adventures In Unova and Beyond. Broadcasting of Pokemon Black & White: Adventures In Unova began on Monday 30th April 2018 at the first episode shown at 7:30am and the second episode at 8am, with the same episodes repeated at 5:30am and 6pm. This broadcasting trend continues throughout the week and as such this morning (1st May 2018), the third and fourth episodes were broadcast with these same episodes being shown in the afternoon. 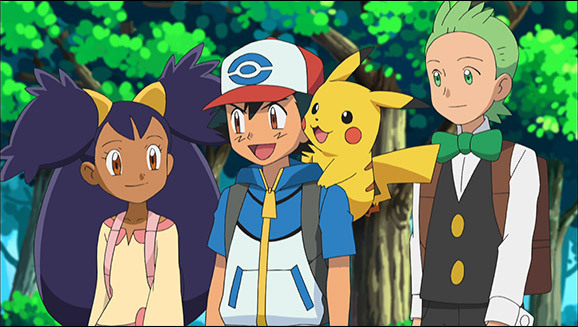 Synopsis: Ash and his friends Iris and Cilan have foiled Team Rocket’s latest evil plan, and a new danger lurks on the horizon! But first, with eight Gym badges in hand, Ash is ready to take on the region’s ultimate challenge: the Unova League, where he’ll face familiar rivals and new opponents in his ongoing quest to become a Pokemon Master! Meanwhile, Iris has been having some trouble connecting with her powerful and stubborn Dragonite-can a visit home to the Village of Dragons help sort things out for the aspiring Dragon Master? And what exciting new adventures await our heroes beyond the Unova League? The answers to come, as the journey continues! POP! MAX is available on Channel 208, Sky Channel 627 and Freesat Channel 604 and Pokemon Black & White: Adventures in Unova will be broadcast each week day at 7:30am and 8am with the same episodes repeated again at 5:30am at 6pm. Further schedule information can be found on the official POP! MAX Website.